I got rank 12 this heroic sith raid and I didn't get any full gear in rewards. Isn't full gear guaranteed after the roll back? I just want answers. It was never a guaranteed full gear, but with a really good chance (around 90%?). She said, and I quote here, "However after reviewing internally we feel confident that we can hit the May date, and we are rolling back the chance of a full gear piece from the Heroic Tier to 100% across all ranks, until the new rewards are live, at which point we will reevaluate“. Then they rolled it back as stated here. 100% not guaranteed. That's the follow-up update to the link I posted above. 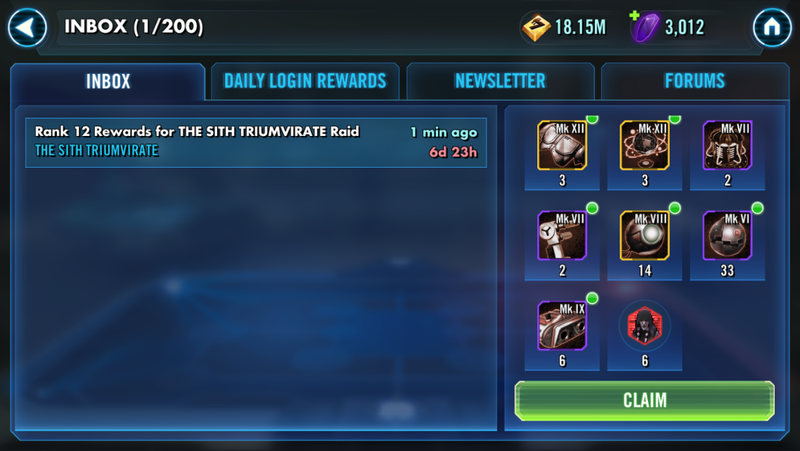 Before 4/11 update full gear is guaranteed in heroic sith raid rewards. Therefore the roll back should refer to the pre 4/11 version. we have decided to completely roll back all the changes to the way they were prior to the update on 4/11/18. No full gear was not guaranteed before that it was 40%. You are still confused of the timeline, so I will lay it out for you. You can point out any mistake you think I have. Update before 11/4 - changed to a flat 40% chance to get a full piece. 11/4 - changed from 40% to 100% chance for full piece. 17/4 - all changes are removed, resulting in the original rewards structure.